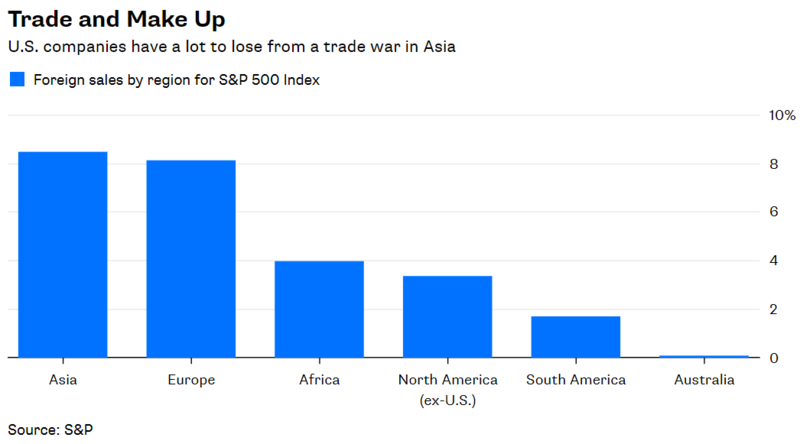 President Donald Trump’s looming trade war is no friend of the U.S. stock market, and that’s bad news for U.S. investors who like to keep their money at home. Free trade is under siege. The White House imposed $50 billion in tariffs on Chinese imports on Friday. China responded in kind. President Trump is now threatening up to $400 billion in additional tariffs, and China is vowing to retaliate again. Its Ministry of Commerce called for “comprehensive quantitative and qualitative measures” if the U.S. imposes additional tariffs. The intensifying trade dispute should worry investors who are reluctant to venture overseas, and there are many of them. According to one estimate, U.S. investors, on average, allocate just 15 percent of their stocks to foreign markets. 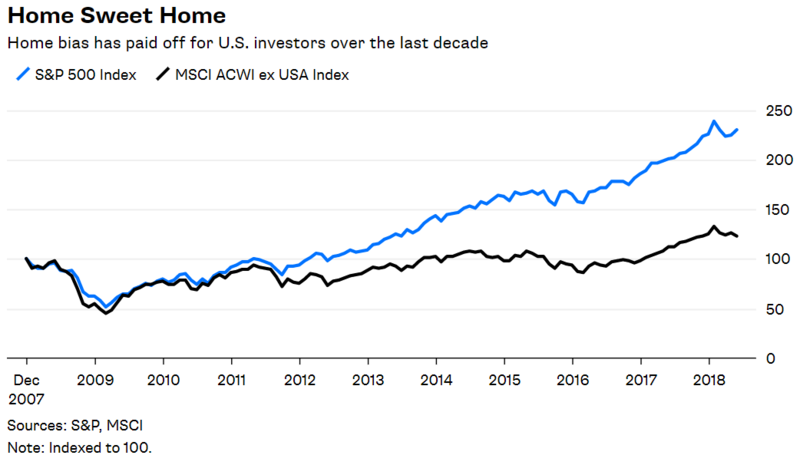 That’s a huge home bias given that the U.S. accounts for roughly half of global stocks by market value and a quarter of the world’s economic output. 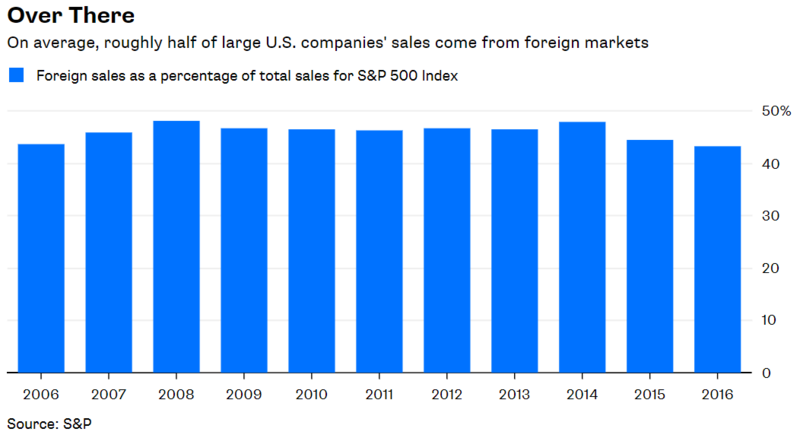 Proponents of home bias argue that U.S. stocks provide plenty of exposure to foreign markets because large U.S. companies sell their wares all over the world. 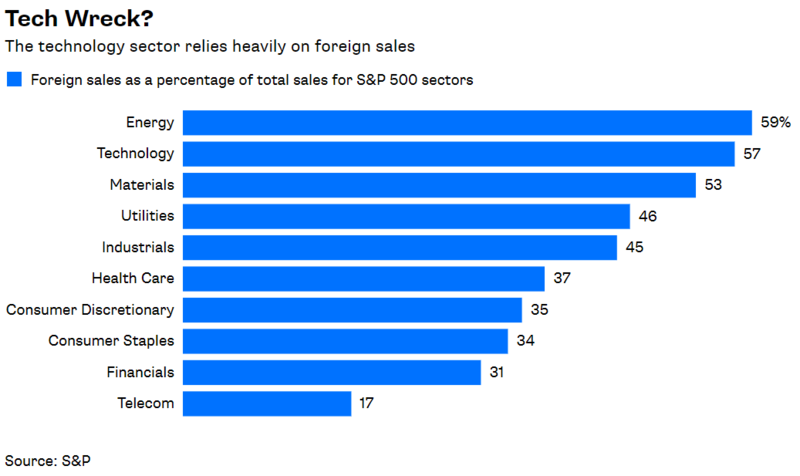 The percentage of S&P 500 sales from foreign countries was 43.2 percent in 2016, according to S&P’s most recent global sales report. That percentage has been reliably between 43 percent and 48 percent since 2006. But Trump’s trade war threatens to upset those foreign sales. Tariffs on U.S. goods will make them more expensive for overseas buyers. And a full-blown trade war could hamper U.S. companies’ foreign operations. None of that is good for business. In fact, the quarrel with China may be particularly damaging. Asia contributed 8.5 percent of S&P 500 sales in 2016, the highest contribution from Asia since 2012 and the most of any foreign region. Sure, a decline in those sales could be offset by greater demand in other regions, but that’s a rich gamble. The S&P 500’s price-to-sales ratio is 2.2 based on trailing 12-month sales per share. That’s nearly 50 percent higher than the average P/S ratio of 1.5 since 1990 — the earliest year for which numbers are available — and matches the previous high notched at the peak of the dot-com craze in 1999. That’s no coincidence. Investors are chasing technology companies again. The P/S ratio of the S&P 500 Information Technology Index is 4.9, more than double the average for S&P 500 companies. Four of the five biggest firms in the S&P 500 by market cap are technology companies — Apple, Google parent Alphabet, Microsoft and Facebook, in that order. Their average P/S ratio is a stunning 7.8. And a trade war would sting technology firms because they rely heavily on foreign sales. The percentage of sales from foreign countries was 57.2 percent for the technology sector in 2016, second only to energy. That, too, has stayed within a tight range of 56 percent to 60 percent since 2010. If sales take a hit, their lofty stock prices will undoubtedly follow and dent the broader market. All of this makes U.S. stocks a risky proxy for overseas investment. 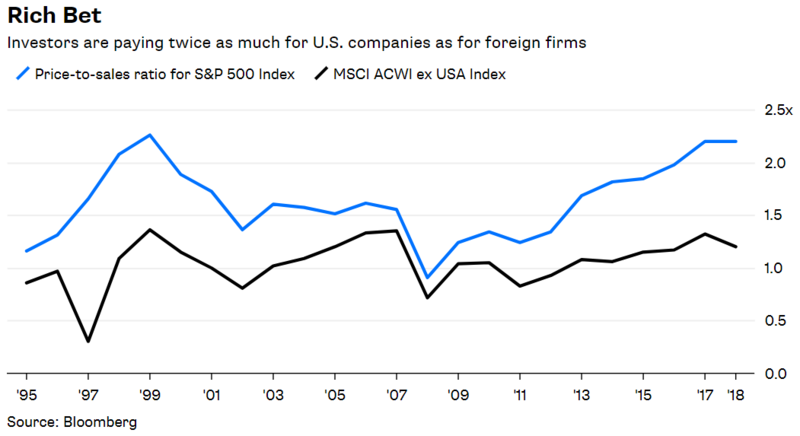 Of course, a trade war could be even less kind to overseas stocks, and it has thus far. The S&P 500 is down 0.7 percent since the first round of tariffs were announced through Tuesday, while the MSCI ACWI ex USA Index — a collection of global stocks that excludes the U.S. — is down 2.8 percent. Even so, less reliance on U.S. stocks is a smarter play. 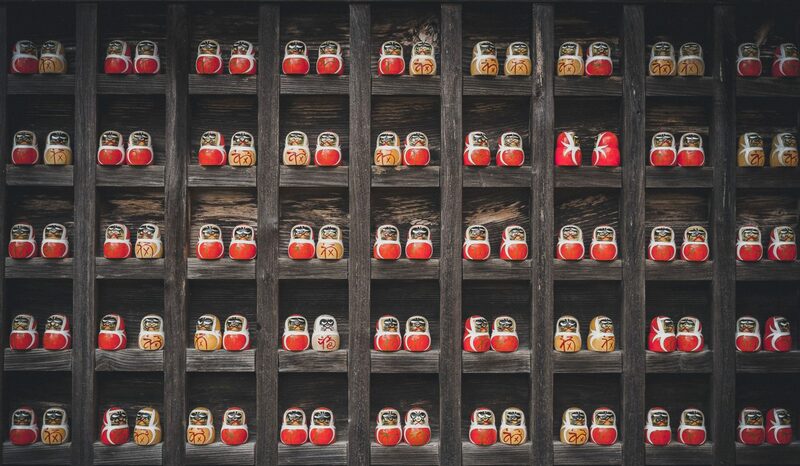 One reason is simple diversification. No one knows how the tariffs will ultimately impact markets, so it’s best to avoid big bets on any one country or region. Also, overseas stock prices appear to be more be sober about the risks ahead. The MSCI index’s P/S ratio is 1.2, or half that of the S&P 500. It won’t be easy for U.S. investors to leave home, however. Their bias has paid off, and no one wants to dump a winner. The S&P 500 is outpacing the MSCI index by 8.2 percentage points this year through Tuesday. It also won in seven of the last 10 years. But past isn’t prologue when it comes to investing. With free trade under attack, the comforts of home aren’t what they used to be.